General Orders No. 9 is one of those films where the adjectives used to describe it—dense, meditative, reflective, confounding—are intended as compliments, yet they will be mistaken by many for pejoratives. And while it would be stubborn and ignorant to think that everyone will respond to it with open arms, its refusal to speak to anyone except itself is what makes it stand proudly on its own mountain. This first film (how is that possible?!) by Robert Persons is a thoroughly absorbing, hypnotizing experience. Persons’s lifelong passion for the arts—painting, poetry, literature, cinema—is reflected in each and every frame. And while one could write tomes about it, ultimately General Orders No. 9 must be experienced for oneself in order to truly grasp what Persons is saying. As a fan of this film, I confess that in many cases I had no idea what Persons is saying, and it’s difficult to determine if he did either. Yet in a case like this, that confusion wasn’t frustrating. It only made my mind more alert. Yet at the same time, the hypnotic pacing and spellbinding tone enabled me to shut off that nagging part of my brain that’s always seeking definitive answers. It’s apparent from the very beginning that Persons is more concerned with asking than answering, and it’s also clear that he doesn’t intend for every piece of voice-over and every startling image to add up in a more cohesive way. To that end, think of General Orders No. 9 as poetry. Not every line will make sense, but if you stay open to it on a moment-to-moment basis, it is guaranteed to reward. And if words aren’t your thing, just sit back and let the beautiful imagery and music (featuring many Stars of the Lid tracks) wash over you. The interstate does not serve. The city is not a place. But all those of a machine. 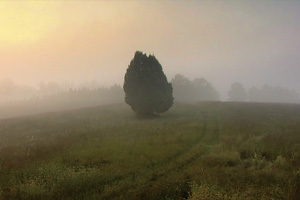 Poetic voice-over, lush Southern imagery, meditative music? When it comes to General Orders No. 9, comparisons to the work of Terrence Malick are inevitable, and while a spiritual and aesthetic kinship clearly exists, the reality is that General Orders No. 9 makes Malick look like a straight shot of Hollywood. It’s Malick minus any semblance of a narrative. All that is left is the mesmerizing internal reflection and somber longing. It sounds odd—brash? obvious?—to say this, but the only way to fairly process General Orders No. 9 is on its own terms. If you’re approaching it from the outside looking in, the front door most likely won’t ever open for you. However and wherever this film lands for each viewer—it will be different in just about every case—the fact remains that we need works of expression like this, which are made because they simply had to be made. In speaking for himself to himself in such a bold artistic way, Robert Persons has spoken more honestly to us all.